A two-headed snake that wowed biologists and residents when it was found in a Northern Virginia yard in September has died, The Washington Post reports. 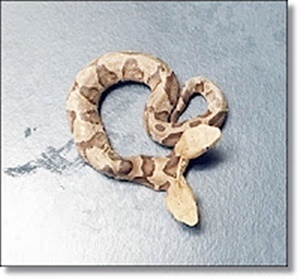 The two-headed baby Eastern Copperhead was found in Woodbridge in early September, the Wildlife Center of Virginia said. According to The Post, JD Kleopfer, the state’s herpetologist, announced the reptile's death early this week. The snake had two tracheas, with the left one more developed, and two esophagi, with the right one more developed. The snake also had a single heart and one set of lungs. When the snake was discovered, Kleopfer said the find was extremely rare because "they just don't live that long."